Gallery Lambton is physically changing locations and adopting a new name; the Judith & Norman Alix Art Gallery is slated to open later in 2012. Have you ever wondered where and when Sarnians first had an opportunity to be inspired by great art? The answer lies in the efforts of a local women's group who fund-raised for Red Cross during WWI and the networking skills of local lawyer Norman Gurd. Gurd followed his father Robert Gurd into legal practice, pursuing his studies in Toronto and returning to Sarnia in 1896 to work with the firm Kittermaster & Gurd. A strong believer in the library system, Gurd is credited with creating and popularizing the slogan, "The library belonds to you, do you belong to the library?" Gurd's enthusiasm for the library system brought him closer to the network that would bring art to Sarnia. 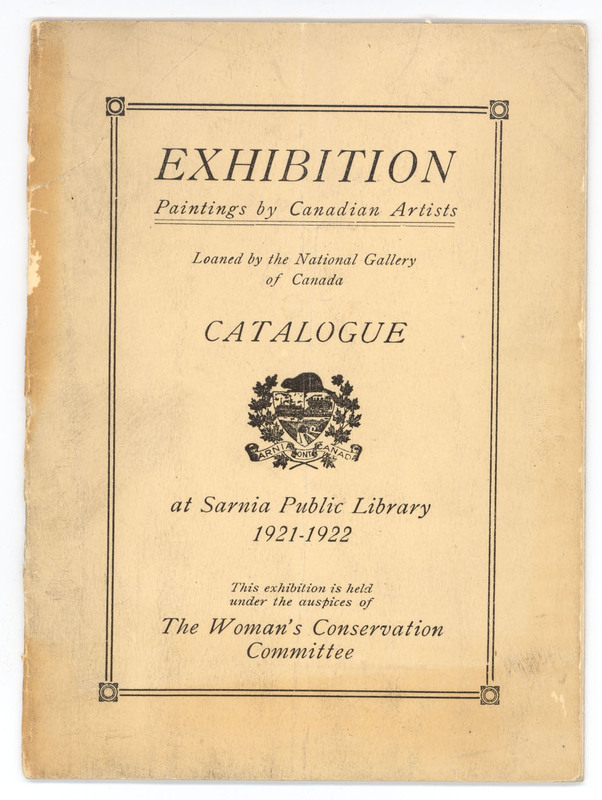 It was the Women's Art Conservation Committee (later the Women's Conservation Art Association) that purchased the first paintings to be hung in the Sarnia Public Library. The committee was an offshoot of the Women's Conservation Committee created during the First World War to raise funds for Red Cross. These ladies collected waste such as paper, cloth, fats and metals, which were in turn sold to local scrap dealers. When WWI came to a close, the Women's Conservation Committee was seeking an alternative recipient for the financial fruits of their fund-raising efforts. Committee president Frances Flintoft wrote to Norman Gurd on July 25, 1919: "We have felt for some time past, that we should have displayed in the library, good pictures which would have an educating influence upon the public and would show them what good Art really is. There is no opportunity of this kind in Sarnia." 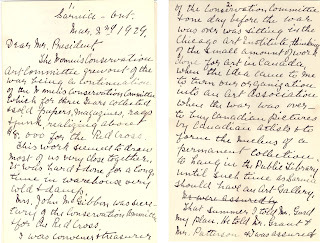 She reflected on this process in a letter on March 2, 1929: "... turn our organization into an art association when the war was over - to buy Canadian pictures by Canadian artists and to form the nucleus of a permanent collection to have in the Public Library until such time as Sarnia should have an art gallery." 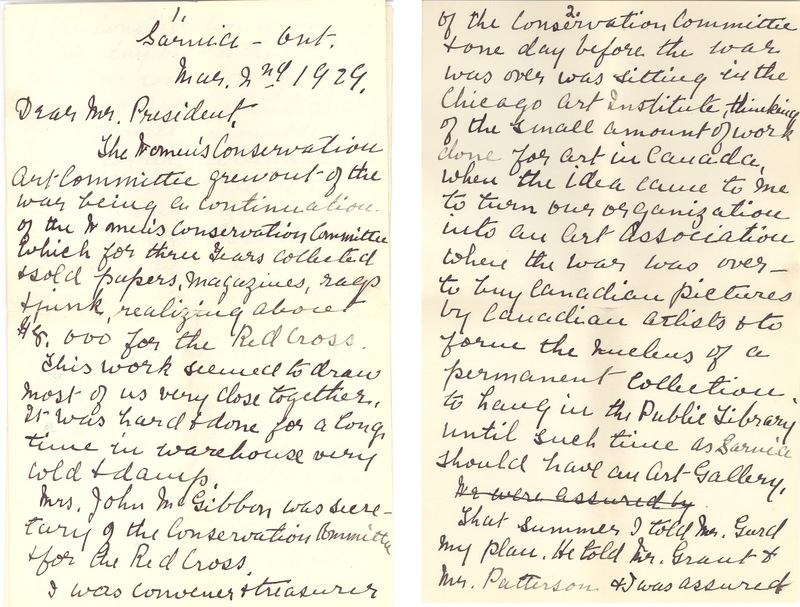 First two pages of a letter from Women's Conservation Art Committee President Frances Flintoft, March 2, 1929 reminiscing about the birth of the art movement in Sarnia. After fulfilling the Red Cross's needs, the Women's Art Conservation Committee had $300.00 left and put this money towards the purchase of three paintings in March, 1920. George L. Smith records in his book, Norman Gurd and the Group of 7, that the pieces purchased were A.Y. Jackson's "Spring Lower Canada," H.B. Palmer's "Sawing Logs" and J.W. Beatty's "Winter near Toronto." 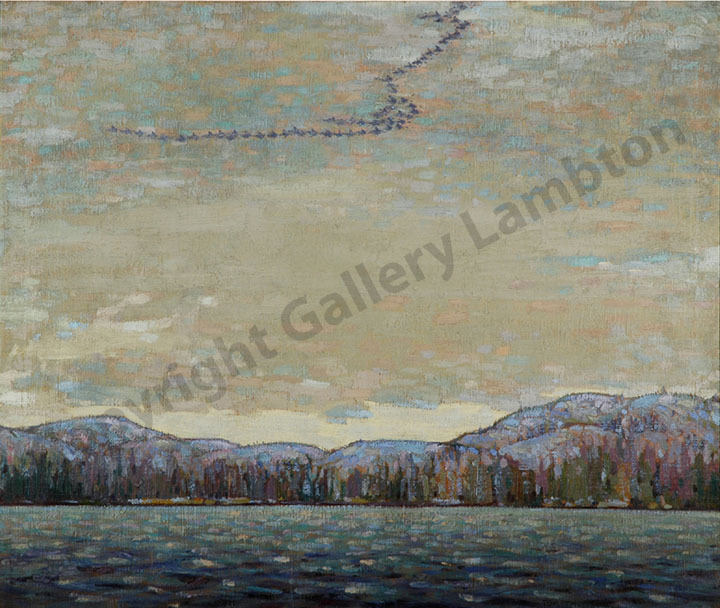 [These links will take you to Gallery Lambton's online catalogue: note in the Credit Line, "Gift of the Sarnia Women's Conservation Art Association."] 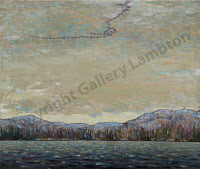 Other paintings purchased by the committee included Tom Thomson's "Chill November" (in December, 1920) and Lawren S. Harris's "Mongoose Lake" (in February, 1925). Sarnia Public Library was proud to display these paintings, offering Sarnians a safe place to gather and appreciate art. Gurd expressed in a letter to Dr. Locke, head of the Toronto Public Library on November 3, 1919, that he would like to acquire "good pictures which would be truly representative of Canadian Art." What came to be known as the Sarnia Public Library and Art Gallery held various exhibitions and encouraged the sale and appreciation of authentic Canadian artwork. Sarnia's art community was born out of the desire to allow the public easy access to great art; the patriotic desire to promote/display Canadian art; and the fund-raising efforts of grassroots community groups. The Lambton Room is fortunate to have some interesting documentation of art's introduction into Sarnia. 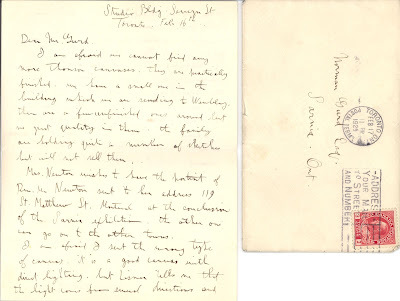 We have preserved much of Norman Gurd's correspondence, including a series of letters received from A.Y. Jackson in the 1920s discussing exhibitions and the sale of artwork. Our collection of catalogues from exhibitions at the Sarnia Public Library is also interesting, along with our biographical information on Gurd and newspaper clippings documenting his contributions to Sarnia. Letter from A.Y. 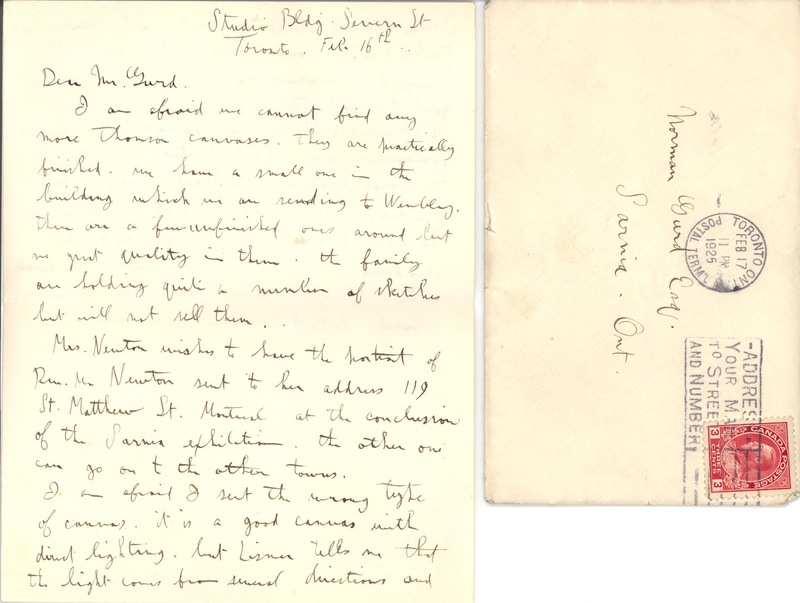 Jackson to Norman Gurd, February 16, 1925. Jackson and Gurd are corresponding about the availability of paintings for upcoming exhibitions. Jackson writes: "I am afraid we cannot find any more Thomson canvases. They are practically finished. We have a small one in the building which we are sending to Wembley. There are a few unfinished ones around but no great quality in them. The family are holding quite a number of sketches but will not sell them..."